Before it became a car park, Quorn Green in the centre of the village, on Station Road was often known as ‘The Black Green’, presumably due to the lack of grass. 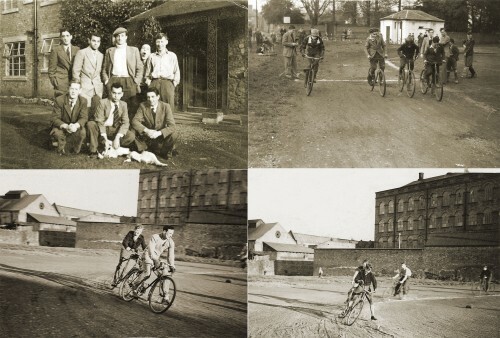 We know that at least from the 1930s, the area was used for cycle racing, which took place on a cinder track. There was a plentiful supply of cinders from Wright’s factory. “I was a student of Mech. Eng. at Loughborough College from 1948 to 1953, staying all that time at the Dower House, Quorn [which was then halls of residence]. They were five of the best years of my life. Good friends and a lovely village to call home. The 1948 Olympics had just been held in London and the PT College was full of British and Commonwealth athletes who after competing had enrolled on a three-year course at the college. One photo [top left] shows fellow students outside the original entrance to the Dower House, with newer extension to the left. Missing information: Can you identify anyone in these photographs?